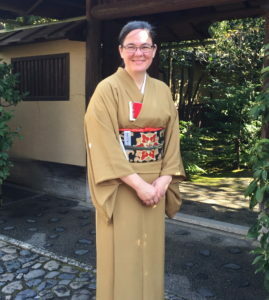 Ruth Sōshin Lionberger is a native of Nebraska (USA), Ms. Lionberger has spent almost 20 years in Japan, working in education and international relations. She began studying the Way of Tea in 2000, receiving her tea name, Sōshin, in 2010. From April 2015 to March 2016, Ms. Lionberger was enrolled in the research course at the Urasenke Gakuen Professional College of Chadō in Kyoto. She teaches the Way of Tea to Japanese and non-Japanese audiences, in both English and Japanese. She is particularly interested in coaching Japanese tea teachers to effectively introduce & teach tea to non-Japanese. Ms. Lionberger is also an Assistant Professor of Humanities at Lakeland University Japan. Ms. Lionberger has done lectures & demonstrations for Diamond Princess Cruises, Yokohama City University, Lakeland University Japan, the University of Nebraska, FEW Japan, Hotel & Residence Roppongi and others. 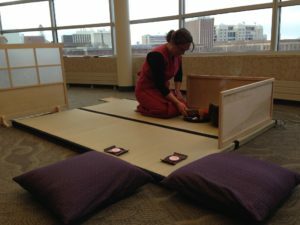 Ruth Lionberger does a demonstration at the University of Nebraska-Lincoln.